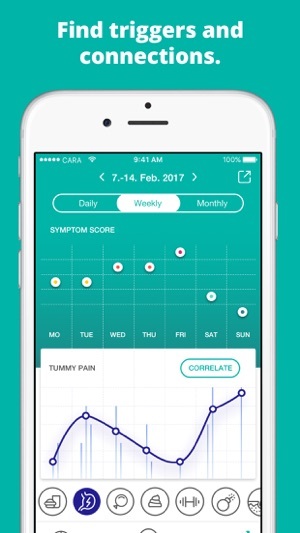 Cara is the easiest way to monitor your (digestive) health. 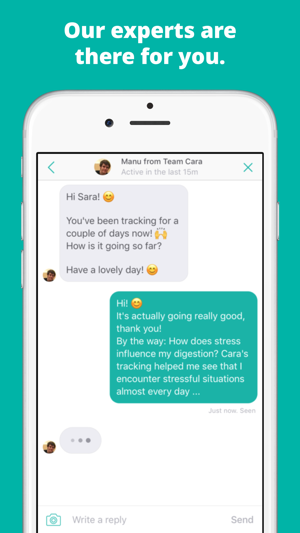 Developed by doctors, Cara helps you to understand the connection between your mind, gut, nutrition & wellbeing. 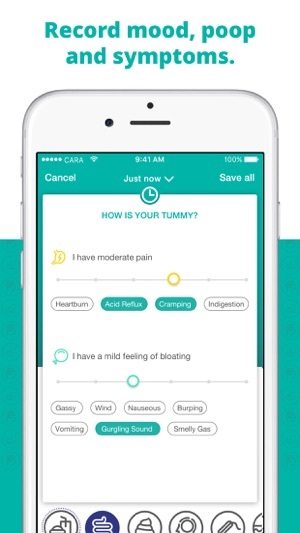 Track food, stress, poop and tummy pain with a few taps. Add individual factors to create your own personalized health diary. "Would give it ten stars if there was an option. 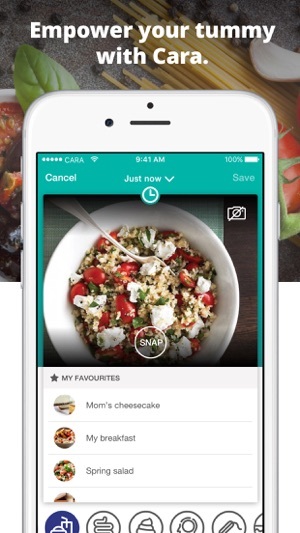 The app is super easy to input food and has a memory so you don't have to keep typing everything in. The symptoms are extensive and easy to input and add details if necessary. The scoring is incredibly accurate to my day and it's been so helpful to filter over different foods and symptoms on various graphs to filter out things I can eat, stress levels, etc. If you have no idea where to start with ur food allergy, IBS whatever then give this a go it's the simplest but most effective app I've tried. The team are friendly and helpful to talk to and take everything into account to make the app even better." "This app is amazing. It does everything I want it to do. It is easy to use, has many features and comes with online advisors should you need any help and they're great too. I am able to record eating times, foods, reactions, symptoms, any medication given, toilet times and there's a note section to type anything else which is helpful when I visit the dietician as she can flick through and see what's going on. Excellent app"
There are no ads in this free app, and if it weren’t free I would gladly pay for it. I have IBS and GERD, and tracking all of my symptoms can be difficult. I usually use MyFitnessPal for food intake but because I don’t have premium, I can’t see the times I ate so I couldn’t correlate foods with symptoms. But this app, Cara, tracks the minute you enter something. You can retroactively add something as well, but only in 15-minute increments. My phone is basically always on me anyway so that’s not a bother. My only complaint is that it doesn’t count “today” as “today” until after 4 am. Sometimes my symptoms cause me to wake at 3 in the morning and it will track it as if it’s the day before. Honestly this would’ve been perfect when I worked swing shift.... oh well. I like that you can add your own meds, foods, create favorite meals so if you eat the same food every day you just select it. No worries about calorie/nutrient info either like in MFP, so you just type what you ate and add it. You can add your own tags in the symptoms, plus there is a journal tab too so you can take notes in the same entry as your food/symptoms. Really, can’t ask for better. 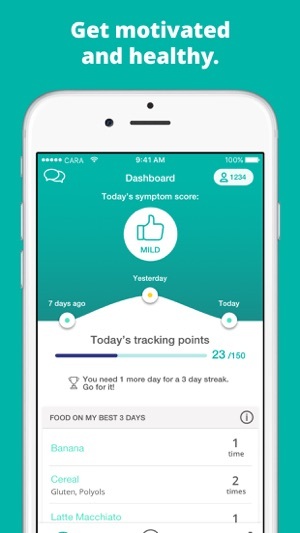 This is an ideal app for any symptoms for any ailment. I have been using this for a while and for those who are having crashing issues... I suggest updating your iOS. I haven’t had a single functioning issue with this app yet. I have been looking for an app to track my workouts, food & water intake and I ran across this app & it was perfect ! I love love this app. The fact that it tracks food, water, mental, pain, sleep, your period, skin, medications, workouts, digestion, stool, and you can add additional notes & symptoms is just exactly what I was looking for plus some!! You can decided to not track certain things (for example if your a guy you can opt out of the period tracking). I love how you can take a picture of the food you eat & you can add ingredients, that’s a plus especially when you make your own food and/or add ingredients to certain foods! The only negative about this app is the fact that you can’t edit the tags that are already preset (For example for the workouts it has kickboxing, yoga and others that I don’t do so I want to delete the tag) but the app makes up for it by allowing you to add & edit your own tags. So it doesn't bother me much. Overall I will recommend this to everyone whether your an athlete or not (I am a professional track athlete) because it tracks everything you need to track daily for a healthy & productive lifestyle! Oh & I think you can share your information with others, haven’t tried this feature yet but I will! I am a male and I suffer from IBS-D, heartburn and acid reflux. This app is helping me to track and take note of my trigger foods and ultimately avoid or at least be aware of the things that are and are not causing my symptoms . It is fairly easy to use this app in conjunction with the FODMAP diet, but many of the foods are more European than American in regards to the commonality and name. Luckily, you can add as many foods and name them, or mis-name, them however you like and that has worked super well when doing to FODMAP plan as there are many strange concoctions and gluten free varieties of foods to track. I also have had great success snapping pictures of my food and saving them in the “saved or favorite” recipes area making it particularly handy to meal prep for multiple days at a time and not have to try and re-enter everything over and over again for any meal you eat it at. Don’t worry, if you forget to save you can roll back to the day you had something previously, pop it open and save it to your favorites list (I do this several times a week). I also find that I may prep salads for a week but add carrots one day or a different/no dressing on another day, I enjoy that the saved recipes are not locked and you can odd or remove any part of it after selecting it as the meal you’re entering.